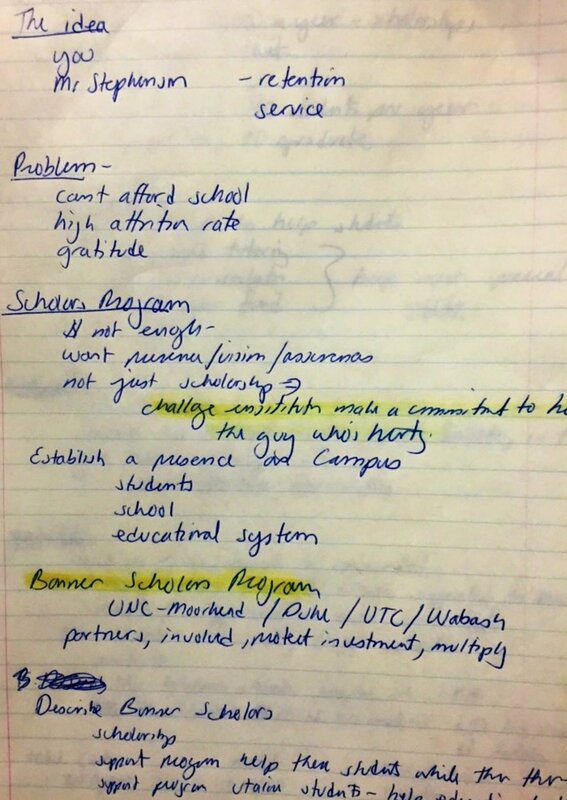 Wayne Meisel’s original notes outlining idea of the Bonner Program, 1990. 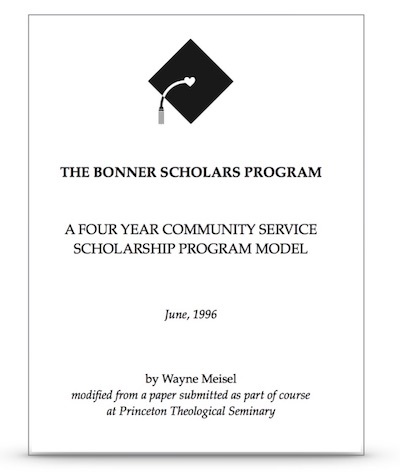 Within a year of Wayne’s arrival at the Foundation, the outlines for the Bonner Scholars Program had come into focus. Neither Mr. nor Mrs. Bonner were able to complete college. Their motivation to help students get a college education was merged with Berea College’s model for student labor. The only difference was that the labor of Bonner Scholars would take the form of community service. The founding of the Bonner Foundation and the Bonner Program is captured in this video which was created for the 25th Anniversary Celebration of The Bonner Program. The Bonner Scholars Program was piloted at Berea College in Fall of 1990. Eleven more schools were added in Fall of 1991 and eleven more schools were selected to join the Bonner Network in Fall of 1992. Robert Hackett was hired as Vice President in February 1992. Bobby had worked closely with Wayne for the first three years of COOL’s existence. Each institution received grants from the Bonner Foundation each semester to support the specific number of students active in the program at that time. However, within two years of the program’s start at Berea College in 1990, Mr. Bonner began the process of making endowment gifts to make the program permanent. 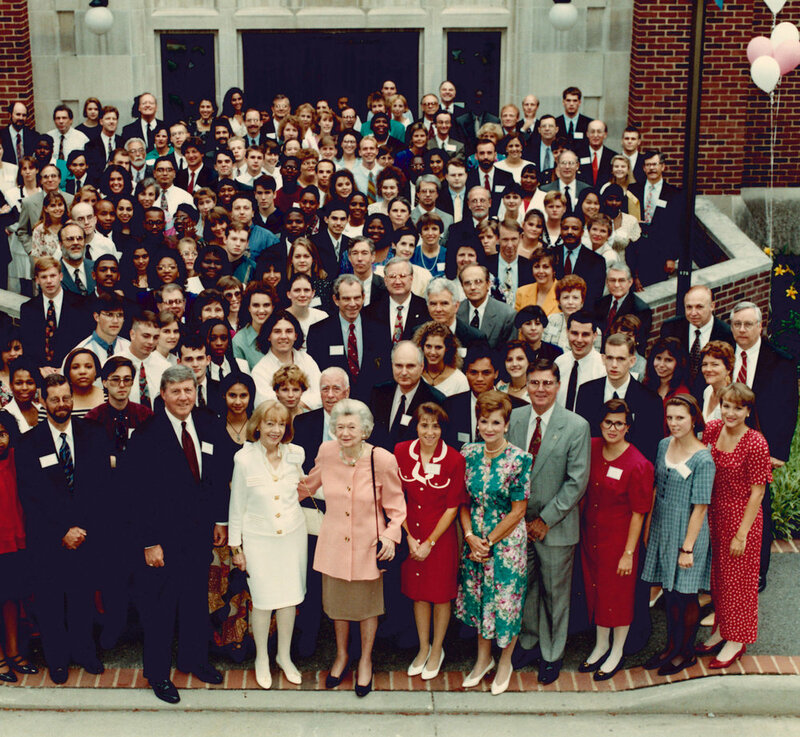 Seven Bonner Scholar Program Endowments were awarded in 1993, just after Mr. Bonner passed away. Mrs. Bonner flanked by Bonner Foundation Board Members, students, staff, faculty, and administrators at our 5th Anniversary Conference at DePauw University in Greencastle, Indiana. Click to enlarge. Our first five years were focused on working with the founding schools to develop and manage the program along the integrated approach. By the end of this period, we had established most of the policies that govern the program today. We also emphasized quality in the program's structure and implementation. Paralleling the development of civic engagement in higher education, our work often focused on the core operational aspects of the program, such as student recruitment, establishing relationships and ongoing positions with external community partners, orientation and training, transportation, and the creation of infrastructure (such as staff positions and administrative support) for campus-wide integration. The next five years saw the development of the Bonner Leader Program as a response to the widespread interest from other schools in the Bonner model, as well as availability of Community Service Federal Work-Study and AmeriCorps funding. From the very beginning of our history, we began receiving inquiries from colleges and universities that were interested in starting a Bonner Program. In the early years, we were forced to say simply that we did not have any funding available to support new programs. However, in 1997 the Federal Work-Study Program began to require schools to allocate 7% of their annual grant to support community service work-study. This allowed us to support new programs at interested colleges and universities with technical assistance in how to leverage available community-service work-study funds and build a Bonner Leader Program. The pilot effort began with six new colleges and was supported by a grant from the Department of Education’s Fund for the Improvement of Postsecondary Education (FIPSE). This 1996 paper by Wayne Meisel conceived the 5 E's Bonner Developmental Model. Click to download. We had also just graduated the initial classes of Bonner Scholars and worked with schools to define the four-year developmental model for students, focusing on the progression of their roles and responsibilities. Finally, we began working with faculty to incorporate Community-Based Research into academic courses and internships, with funding provided by the first of three 3-year Federal grants from the Corporation for National and Community Service. This phase was important because it allowed us to connect the basics of the program with broader institutional and society aims. Through a network-wide listening process, the Foundation distilled the six Common Commitments that define and focus the program's community engagement and student development goals. These commitments ensure that students also develop the habits of lifelong citizenship and define key values for themselves. We continued to refine programmatic elements of the Bonner Program, including the First Year Service Trip, Sophomore Exchange, one-to-one advising meetings, and Senior Presentations of Learning. These elements often were the result of innovation and best practices developed at the campus level, which were also affirmed by emerging literature and scholarship about the link of community service and service-learning to positive student learning outcomes. Finally, we launched the longitudinal Bonner Student Impact Survey to assess the program’s impact on participating students and alumni. With funding from FIPSE, we worked with a group of 15 Bonner schools to develop curricular approaches to mirror the Bonner developmental journey through civic engagement certificates, concentrations, and minors. We also expanded our community-based research efforts to incorporate public policy issue brief research for interested community groups. By the end of this period, every campus in our network had established a campus-wide center or office for community service and learning, with the Bonner Program playing an important catalytic role. Many of the campuses had also earned the Carnegie Community Engagement Classification (launched in 2006) and/or the President's Honor Roll for Community Service. These developments suggested how colleges and universities in in the Bonner network remained at the cutting-edge of the evolving field of higher education civic engagement. In part due to our work on civic engagement minors, the Bonner Foundation developed an ongoing partnership with the Association of American Colleges and Universities and its Liberal Education and America's Promise (LEAP) initiative. Foundation staff were involved in the VALUE Initiative (Valid Assessment of Learning in Undergraduate Education), which focused on identifying best practices in undergraduate education and ways to authentically assess student learning. We were involved in the development of national rubrics on civic engagement and integrative learning. Recognizing that the Bonner Program by design included a series of proven practices, we organized a multi-year initiative to support campus teams to develop high impact practices (HIPs) with high impact community partnership practices. We also began to make a clearer distinctions in our community outreach and student development models between direct service placements and capacity-building projects, as well as between supporting direct service-providing agencies and community-wide collaboratives. This work has set the stage or our current program and academic initiatives, allowing us to understand how civic engagement can be integrated as a viable mechanism for broader student success as well as quantifiable community impact. This direction has kept us at the forefront of the national civic engagement movement in higher education. We continue to explore ways to deepen the student experience both in their service and their learning through developmental pathways that integrate their coursework, research, service, internships, and other experiences and climate in a community-engaged capstone project. This initiative fits with AAC&U's 2015 LEAP Challenge, which has called for all undergraduates to have an integrative experience, or Signature Work, through which they apply knowledge to addressing issues that matter to them and society. We are in the process of launching a Bonner Student Data Study, a revised Bonner Student Impact Survey, and exploring ways to incorporate qualitative assessments into the program through ePortfolios and other means. We also began an effort to introduce Social Action as a high impact community engagement model that could be implemented in academic courses or in co-curricular training. Finally, we are developing a Bonner Alumni Directory for our 15,000+ alumni which we hope they and current Bonners will also use to find one another for summer internship and job opportunities, as well as to seek advice on their service efforts.